Got up at 5:30am today to be surprised by frigid weather! Brrrrr. The reports said it was down to 20 degrees during the night and it felt like mid 40's in the morning. Brian and I met Pat at his house and got prepared to go fishing. It was very low tide and as a result my boat was unable to float off the lift. Crap. Luckily, Pat brought his boat down and there was enough water for it to launch. We switched gears and went on the Scarab instead. It was COLD. Numbingly cold. Pat hooked into a monster sized bluefish very early on so that kept our blood pumping enough to stick it out for another hour or so. This was followed up by a couple more small bluefish by Brian and I lost one after it bit through my line. By 8:00 I couldn't feel my fingers or toes so we decided to pack it in for the day. Pat donated his bluefish to the SDC cause and I was happy to accept. More for the smoker. If you read yesterday's post, my food for the day was more of the same: rice, beans, smoked bluefish, greens. Something sweet is definitely missing and I am going to revamp my weekly rewards in order to fill this in. Currently I have as my week 2 reward a big chocolate bar. That certainly give me a candy/sweet boost but maybe there is something that could be sweet and nutritious as well. I'll have to do some more thinking about this. Maybe it's time to read last years posts to see what I was really craving at this point. I should be busy with softball for most of the morning so that should distract me from the diet for a while. Also planning on going to my parents house for a late afternoon visit. The food temptations are always difficult there. We'll see. Somewhere in between I have to smoke this bluefish. 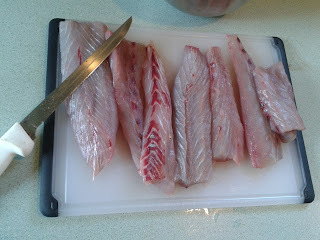 I filleted the fish in the afternoon and stuck it in a salt water brine for an overnight marinade. The last batch was a little too salty so I will give this batch an extra rinse. That's it for today.